The main function of the software is to register all existing patient records and to keep the corresponding register of patients? admissions. It can be used in any hospital admission units which provide registration of their clients. The register of patient admissions of the current software is presented in two options ? graphical and in tables. All the entered records will have a definite status. With the software, the process of keeping patient records is simplified. Personal data (full name, date of birth, etc.) or contact details of patients can be stored. It will be possible to introduce additional fields at one?s sole discretion and according to one?s needs; data about medical insurance held; a list of all illnesses which the patient has had during his life; existing and set diagnoses; a list of performed diagnostic activities. It is very convenient to attach documents, such as photos, and keep records of all provided services as lists. Simple client billing. Keeping bill payment records. The function of keeping a catalogue of services to be provided makes it possible to see not just a list of them, but also to add them to bills. If necessary, every bill can be generated from the lists of services which have not been paid yet in patient records. Control using statistics. 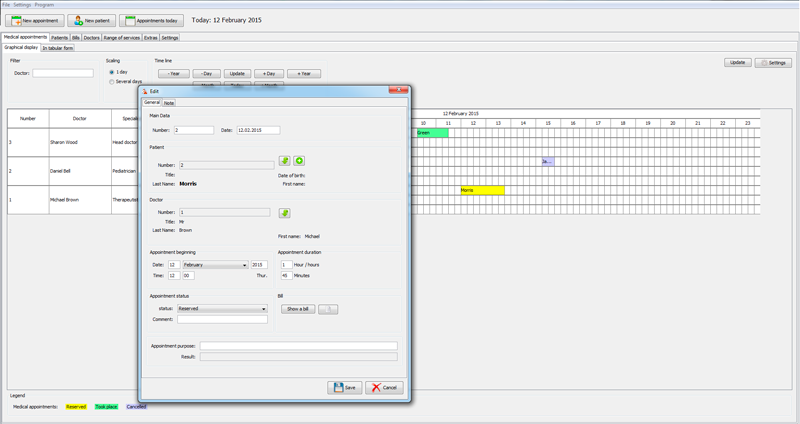 Using the software will provide an opportunity to create appointment records for all the doctors who work in the clinic. The list of doctors can be unlimited. Furthermore, there are different statistics created, allowing you to look through the diagrams of change in the number of patients, in all records for the past 12 months, diagnoses set during the specified period (as a pie chart), possible complaints of clients during the specified period (as a pie chart) as well as diagrams with all revenues received for the services provided. You can be sure that working with the current software is simple. It is important to note that users do not need any special skills in computer operation.